The California gold rush didn’t get started until 1849 but in Michigan, the rush for “white gold” – the towering, green-topped white pines in dense Michigan forests – had begun in the early 1830s. By 1850, water-powered sawmills dotted the White Lake area, 11 miles north of Muskegon, churning out high-grade planks. The problem was the river, which did not serve as a good passage between White Lake and Lake Michigan until 1870. Not until a 30-foot-wide channel was cut between the two lakes, did lumber regularly fill the schooners bound for Chicago and Milwaukee. The timing was fortuitous. In the aftermath of the devastating Chicago Fire of 1871, the need to rebuild the city greatly increased the demand for lumber. The following year, a pier light was erected on the channel’s south side. Captain William Robinson, born in England in 1831, tended the light. The son and grandson of ship captains, Robinson ran away to sea at a young age. He and his wife Sara had 13 children, five of them born in the White Lake area; 11 survived to adulthood. The official White River Light Station was not built until the autumn of 1875. Captain William Robinson, helped by five other men, used yellow-hued bricks and limestone from the Great Lakes region for its foundation. 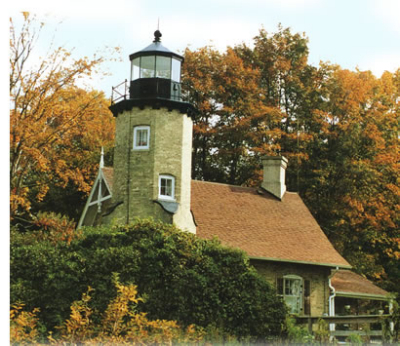 The U.S. Light House Service sent the fittings: a cast iron lantern room, glass windows and the copper roof. The main tower’s cast iron spiral staircase came from Muskegon. The station was finished just before the new year of 1876. The Fresnel lens and machinery didn’t arrive till the following spring. White River’s lighthouse began operation on May 13. By the mid 1880s, the white pines had been depleted but hemlocks were next. Steam ships replaced schooners, and railroads now carried lumber during the 1890s. The shipping industry adapted as steamers transported fruit, grain and summer tourists back and forth from Chicago, Milwaukee and the White Lake area. In 1919, the government pushed William Robinson to retire but after 43 years of service, he refused to leave the station. Luckily his grandson, William Bush, had been doing most of the work since 1911 as Assistant Keeper. William Robinson died on the last official day of his service in April at nearly 88 years old. However there are those who claim Captain Robinson has never left the lighthouse. If visitors listen closely, they might hear the Captain still shuffling about the building, his cane making a distinctive sound. Even the ghost of his wife Sara is said to occasionally make her presence known by performing a little household cleaning. 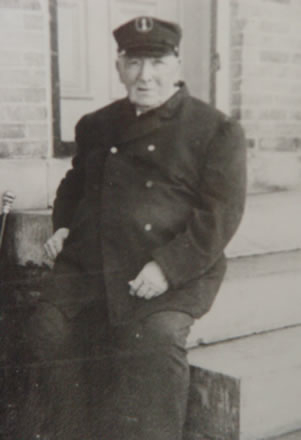 As for the living, his son Thomas, hired as Assistant Keeper from 1877 to 1882 at his father’s side, ended up serving with the Light House Service until he retired in 1928 from the Muskegon Lighthouse. William Bush served until 1943. With the advent of the automobile industry and trucking, shipping had decreased by 1936. But the White River Light House station continued operation. Frances Marshall, who took pride serving as a female lighthouse keeper, kept the light from 1949 until 1954. In fact, Marshall stumped the 1953 What’s My Line? TV show panel when they couldn’t guess her occupation. One other keeper served before the U.S. Coast Guard decommissioned the station in 1960. The Sylvan Beach Association raised money to buy the lighthouse for just over $6,000. Thanks to them, the White River Light Station serves as a popular museum for the area.